Today’s lesson is taken from Page 18 of Bethesdabasics (ISBN 978-0-9570134-0-7 The PArtisan Press 2010 £12 – but then you have already bought a copy) – Wholemeal. 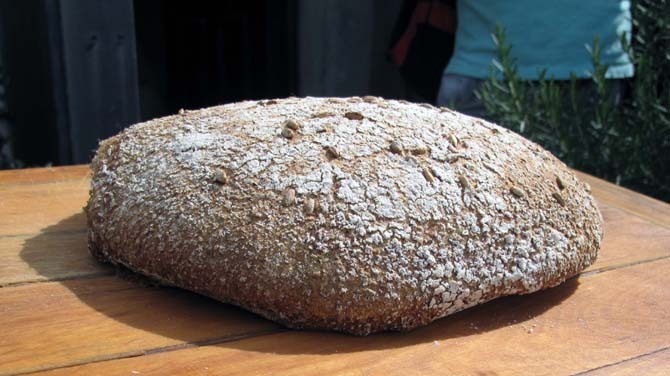 I’ve always used white starter to leaven my wholemeal – not as policy but because I can’t be bothered to keep a wholemeal starter. Anyway, the 11% or so white flour probably makes the loaf a bit lighter. I inherited the remains of a number of different flours after the Bethesdabakin’5 event that Anne & Andy Parry had kindly brought up from their Felin Ganol Watermill down in Ceredigion (www.felinganol.co.uk) and I’ve been working my way through the wholemeals in the past few weeks. These breads were made with their regular wholemeal which, if I understand correctly, is a mixture of grains blended by the grain merchant to maintain a standard gluten content specially for small millers. That’s about the same rise as I would expect to get from my usual flour, Doves. Then I started to use a flour called Tybalt, an organic wheat grown by Aberystwyth University. This had noticeably less lift but great flavour (no photos I’m afraid). Personally I’m not concerned when a loaf spreads – flavour and texture are the thing. But I have to worry about customers whose expectations might be different. I was totally taken aback by the coarseness of the flour (the diameter of the circle is only just over five inches). That’s a bit misleading because the whole ranged between very fine and very coarse and I’m not sure if it would normally be bolted to produce a single grade. – and I did start to get worried about customer response. I didn’t want to increase the starter because even though it would probably have helped the rise it would have increased the proportion of white flour in the dough. 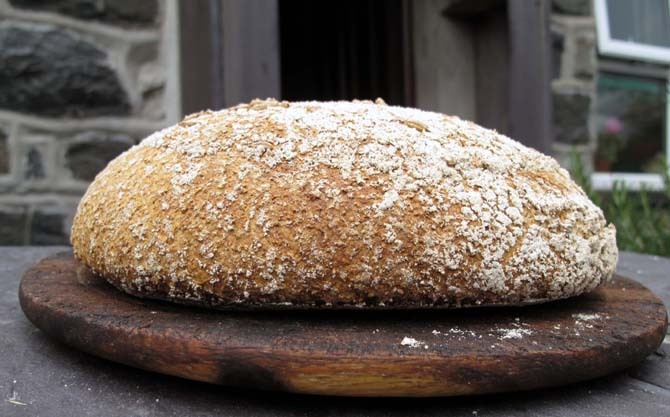 The only solution I could think of, even though I couldn’t really understand the logic of it, was to use part of the wholemeal and water from the dough in a final starter refreshment which was doubled from the original and contained only wholemeal flour. That will do me. That’s as good as bread gets – real depth of flavour. My only problem now is how to get a regular supply of Felin Ganol flour. Had an email from Anne at Felin Ganol. Seems I got the wrong end of the stick with “dyffryn”. Whatever it was, it was very tasty. I wonder if the better structure of the second loaf (with the wholemeal starter in it) is something to do with increased gluten release? My thinking being that prolonged hydration of the wholemeal is required to release more of the gluten than if you were just working with strong white. I have recently started baking a 100% honey wholemeal from a Peter Reinhart recipe, which requires soaking one half of the wholemeal in milk overnight and the other half in water, before combining them with baker’s yeast and honey (err, obviously) into a dough that a short while becomes the loaf. It’s not as strong – in the gluten sense – as the whites I make, but definitely better than if I were making a 100% wholemeal without any prolonged hydration. Not sure I undersatnd this. 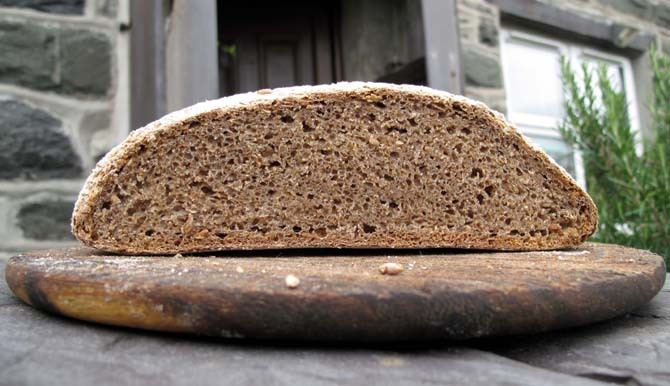 My usual wholemeal loaf, which would use Doves, and which I am quite happy with, has exactly the same proving time as the bread made with Felin Ganol. So why should one wholemeal flour need longer for gluten release than the other? Maybe Doves add ascorbic acid to their wholemeal, I don’t know. Maybe the Felin Ganol flour is softer and is coarser and needs a little more attention. I’ve never got on very well with Peter Reinhart. What’s the logic of soaking half the flour in water and half in milk? 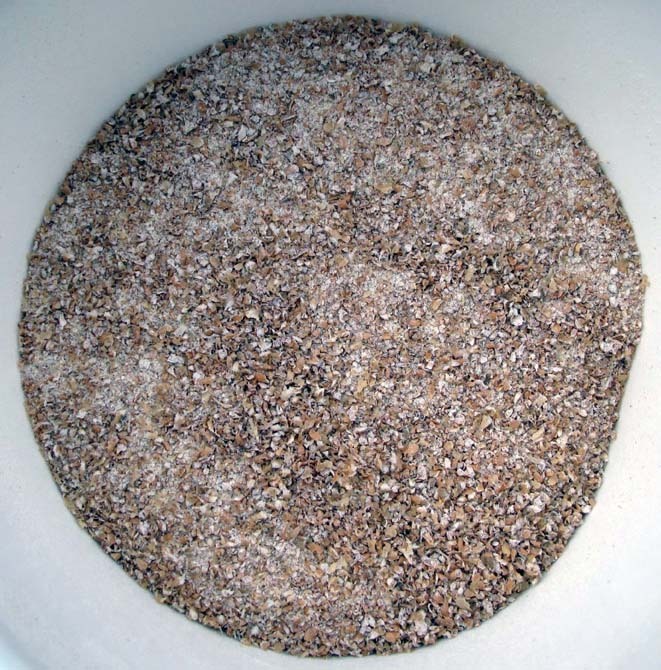 The technique relies on both a soaker and a pre-ferment. 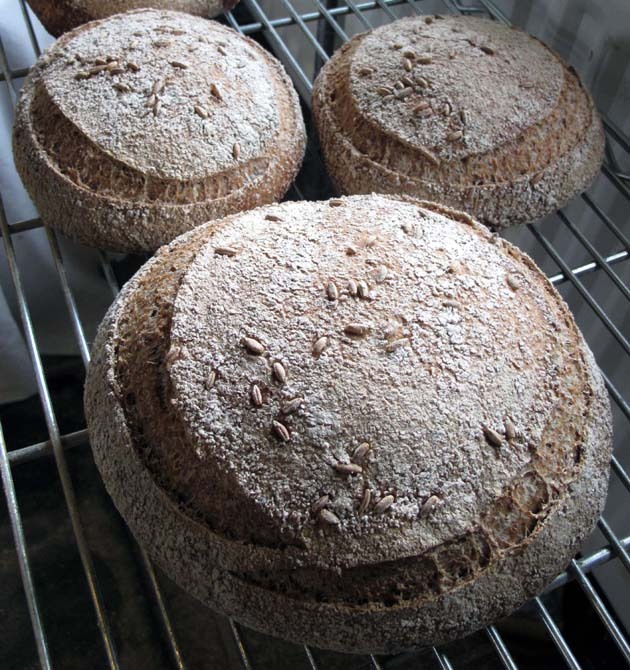 In the case of the 100% wholemeal recipe, 90% of the flour gets hydrated the night before, with only 10% fresh being added for the final dough. Of that 90%, half is the soaker and gets milk and a little salt, the other half is the biga and gets water and a little yeast (bakers, in this case). Theory is that the pre-fermented part develops flavour but also acidity to control the enzymes which can attack the starches and proteins which result in gummy loaf: the soaker (paradoxically?) encourages enzyme activity, though without the risk of over-fermentation ’cause it contains no yeast, and the salt is there to provide moderate control over the enzymes’ development. The final dough contains around double the amount of bakers yeast you’d usually use, simply because all the flavour development is done, so proofing can be done in about an hour, before baking. Anyway, I won’t profess to getting all the science, but it does result in a mighty nice loaf! Now to go off and try it with just natural yeast…! Just shows the complications you have to go through trying to make a decent loaf with commercial yeast!